Everyone having a tropical destination wedding dreams of the listening to the ocean rolling onto the shore. 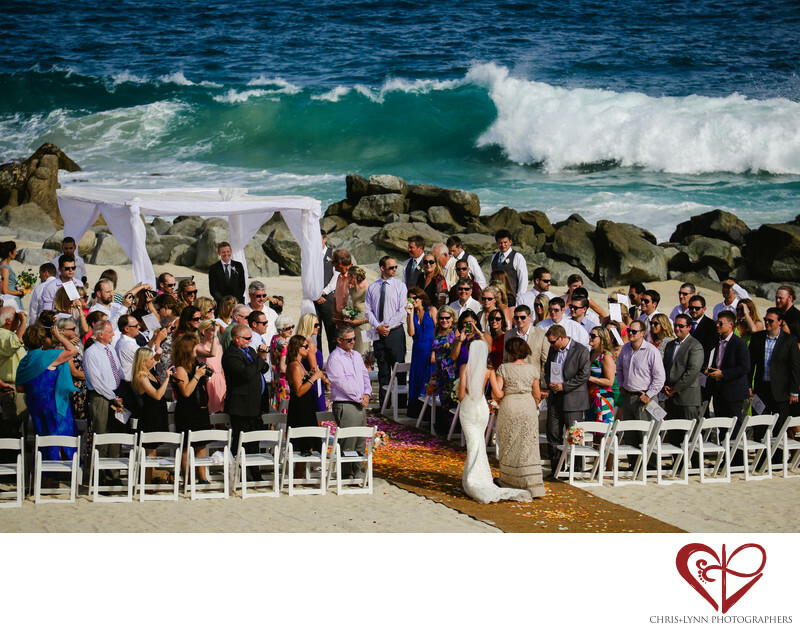 This Cabo bride got to hear the crash of giant waves while she was walking down the aisle! This particular beach location at the Hilton is only available at certain times of the year when the tides are low. But the bride knew she wanted to be as close to the ocean as possible as she said her vows. The couple have a love affair with Mexico, having their first trip together in Los Cabos, getting engaged on the beach in Playa del Carmen on the Riviera Maya and finally having their wedding here. The bride walked down the aisle in her Vera Wang dress and flip-flops - the perfect combination for a bride who loves design and fashion and also fun! Her walk to the groom as the waves crashed on the beach was one of her favorite moments of the day. And one of our favorite photos! It was shot from high above the beach with a Canon 70-300mm lens to compress the the background of the Pacific Ocean, accentuating the size of the rollers coming in. Having the two of us photograph the wedding allows us the flexibility to capture moments at from different perspectives. Especially at the ceremony, this is so important because there is so much happening. We want to make sure to capture the bride's expression as she walks down the aisle, the groom's reaction to this moment as well as an overall scene like this one that tells the full story of this most special moment from the setting, to the anticipation of the guests, to the back of the bride's dress to the groom's welcoming smile. This wedding was featured in multiple publications including Jet Fete. Location: Km. 19.5, Carr. Transpeninsular, Caudillos del Sur, 23447 Cd Apodaca, B.C.S., Mexico Hilton Los Cabos Beach & Golf Resort. 1/1250; f/5.6; ISO 100; 200.0 mm.